Eamon Ó Cuív (L) in Tyrone launching Sorcha McAnespy's campaign with Senator Mark Daly. FIANNA FÁÍL LEADER Micheál Martin has said he will consider Eamon Ó Cuív’s frontbench position after he went rogue and announced a local election candidate in Tyrone without Martin’s permission. 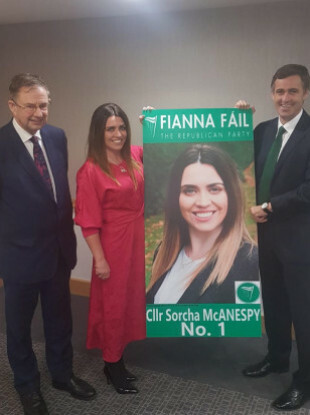 At an event late last month, councillor Sorcha McAnespy, who is already a member of the party’s national executive, was announced as Fianna Fáíl’s candidate in the local elections – the party’s first steps across the border. Standing next to TD Éamon Ó Cuív, the spokesperson on Regional Development, Rural Affairs and the Gaeltacht, as well as Senator Mark Daly, McAnespy is holding a photo of herself with the Fianna Fail branding. The two announced themselves as the directors of McAnespy’s campaign. Daly was punished for his part yesterday and was sacked as the party’s deputy leader in the Seanad. He also had his portfolio as Seanad spokesperson for Foreign Affairs, Diaspora and Brexit taken away. Speaking on Newstalk Breakfast this morning, Martin said that Ó Cuív’s position will be dealt with today. Although he would not be drawn directly, Martin said Ó Cuív’s punishment, if any, will be “deliberated on today”. McAnespy claimed the Fianna Fáil party leader informed her that she will be a Fianna Fáil Party candidate in the Northern Ireland local elections. This was backed up by a number of people who sit on the executive. When asked by TheJournal.ie if this was the case, a press spokesperson said “no comment” at the time. Fianna Fáil deputy leader Dara Calleary has said it was “premature” for Councillor McAnespy to be told she would be a Fianna Fáil candidate at the next local elections in the north. However, the party rolled back on the announcement in a tweet, stating that no such decision to run candidates in the north had been taken and the party is still in talks with the SDLP. There has been talk about a possible merger between the two parties in the future. Email “Micheál Martin to decide Eamon Ó Cuív's fate today for launching candidate without permission”. Feedback on “Micheál Martin to decide Eamon Ó Cuív's fate today for launching candidate without permission”.